“Katharina’s husband isn’t coming home for the weekend—again—so she’s on her own. When their chaotic daughter Helli has a nosebleed, Kat has to dash off to school to pick her up. Mareike Krügel has written four novels, Look At Me is the first to be translated from German to English by Imogen Taylor. Told from the perspective of a mom named Katha, the story is about truths, mortality, marriage, motherhood, sexism, and gender roles. Katha is a musicologist who teaches music to Kindergartens. She hasn’t been able to finish her thesis or find a satisfying career due to her daughter Helli, a very busy, impulsive, eleven-year-old who may have ADHD. Katha’s son Alex is “the perfect son”, smart, considerate, and good looking. Katha’s husband Costas accepted a job working away from home after being laid off from his dream job. We also get to meet Sissi (Katha’s sister), Ann-Brit (Katha’s long time friend), Theo & Heinz (transgender neighbors), and Kilian (Katha’s male friend from school). I found Katha to be incredibly annoying and had a really hard time caring about her. Helli stole the show for me. She reminded me a lot of my own nine-year-old son. There are a few moments that come across as unbelievable, but that may be due to the translation. 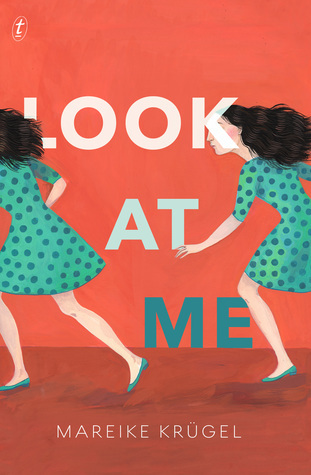 Look At Me is a quirky, funny story with a crazy ending that reminds us to be grateful for what we have and the people who love us. Sounds like you had mixed feelings about this book. I really Iike the cover, though.